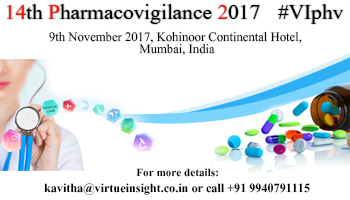 The Pharmacovigilance conference, organized yearly by Virtue Insight, is a unique event where key stakeholders gather with the aim of promoting patient safety and undertaking to continue work towards a more efficient pharmacovigilance system. This is the opportunity to engage and sit alongside the pioneers who are driving forward innovation in pharmacovigilance. Early-Bird Discount until 26 September 2017 - 1 Delegate Pass – (INR 6,000 + GST (18%) per delegate). Standard Price from 27 September 2017– 1 or 2 Delegates – (INR 7,000 + GST (18%) per delegate). · Conference Sponsor & Exhibition Stalls are also available. We also have sponsorship opportunities available for the event which gives you an opportunity to speak/exhibit and create brand awareness. In addition, the networking opportunities in focused and relevant industry gathering provide the personal contact necessary for business development efforts. Be a part of this conference and explore benefit-risk management strategies and patient-centric approaches and how you can tackle the challenges of social media and drug safety legislation globally.